Club Simple Paradise opened it's doors just 4 month ago. It is one of the newer establishments on the grid but the people like new places to explore. 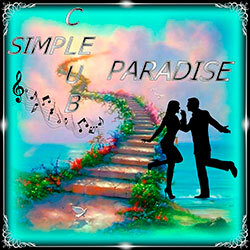 Club Simple Paradise is an outdoor club with a romantic night sky shining from above. The atmosphere is enchanting with lovely and heart warming decor. To set the mood for couples, a restaurant with tables settings for 2 await you around the dance floor.If you would like to cuddle in the arms of your significant other, there are seating areas around the venue and dance floor for guests to lounge around and chat. C.S.P. is open daily from 6 am SLT until 4pm SLT with a DJ who set the tone with great music genres from all around the world. The Music genre ranges from romantic, slow, jazz,disco, pop, rock, trance, house......you name it..we play it. All are welcome to make requests or dedications. All DJs are experienced with more then 3 year spinning in the most popular clubs in Second Life. Club owner & Founder Isabella is a European lady who takes gret pride in her venue. Her goal is to provide a calm relaxing atmosphere for all who wants a relaxing time with their friend, family and loved ones. Club Simple Paradise is hiring new Staff, Host & DJs to make the family Gown.